We believe in giving the power of knowledge to all our students. It is a quest, by way of excellence that I, for my students, seek to achieve in the field of legal education. ALC has created a benchmark in the field of global education through its contribution in various educational, corporate and legal sectors. ALC is one of the endeavors of ASIAN EDUCATION GROUP, which has traveled a long way to achieve its goal of being one of the top Law colleges. 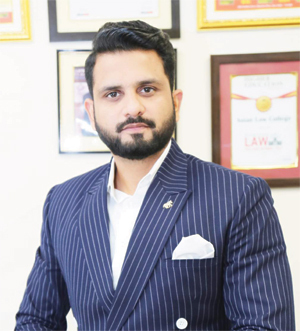 ALC provides a fertile ground for the flowering of the potentials of not only being an efficient lawyer but also a true cosmopolitan and responsible contributor to universal jurisprudence by encouraging close interactions between students, scholars and thinkers from across the country and the world. At the same time, we take care that young minds entering our portals are provided with all necessary guidance and moral virtues. Our team at ALC is highly dedicated towards its objective of making ALC, a better place for national as well as international students. In today’s transcending world, the function of education has changed from teaching to learning which casts a mutual responsibility upon the institution as well as students to make education a cannon loaded with power and progress. I wish ALC and its prospective students all the best to deliver results with academic excellence.